Students are more likely to meet your expectations if you clearly state them. Your expectations should be easy to find and provided in multiple ways. Some students learn best by reading. Others need to hear the instructions. Others need visuals. While instructors should have high expectations of students, we should also provide the support students need to meet those expectations. Many online courses feature discussion boards. If you want your students to provide a certain level of writing, give them an example of that style of writing. Provide example phrases they can use that are appropriate for your discipline. Remind them how to cite and reference correctly in your discipline. Unless you tell them what you expect, the discussion posts will likely have an overly conversational tone rather than an academic or professional tone. Also, be clear about the level of detail or length you expect. In addition to providing discussion prompts, provide comment prompts if you expect students to comment on your posts or the posts of other students. Disagreement between students is fine as long as you set ground rules for how to be respectful when students disagree. Also, teaching students how to participate in civil discourse is critical for all students, not just online students. In addition, if you expect comments to be more than one or two sentences, state your minimum expectations. One alternative to written discussion boards is allowing students to post their responses in the discussion board as videos instead of text. For online classes, this can really help facilitate social presence. Another alternative to written discussion boards is allowing students to post their responses using audio files. This is another way to provide human interaction and increase engagement. While discussion boards and exams are acceptable forms of assessment, there are many other forms of assessment. Also, many employers want graduates who can work effectively in groups. Group projects also provide variety and increase student connections to the online class. You could assign students to a small group to complete a task or you could ask half the class to participate in one discussion and the other half of the class to participate in another discussion. Either strategy can make the class more personal. In addition to having students complete short-term tasks individually or in a group, you can also assign long-term projects where students have to revisit and extend their learning throughout the semester. For example, I have students work in small groups to complete research projects throughout each semester. In many cases, students don't have the opportunity to revise their work. While this strategy is a reasonable method of formative assessment, giving students the opportunity to turn in rough drafts and incorporate feedback into final drafts can promote deeper learning. Today's collaborative tools allow instructors and students in online classes to communicate in real-time. When used effectively, these sessions can increase social presence and instructor presence in online classes. 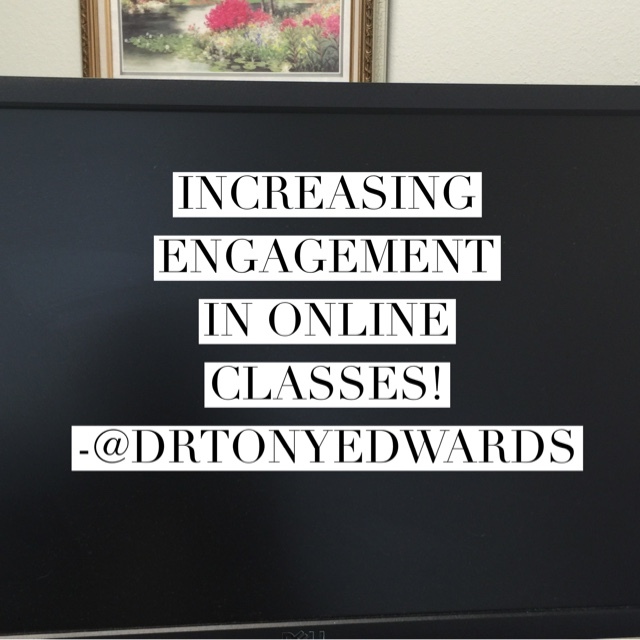 Question: What tips do you have for increasing engagement in online classes? Please subscribe for email updates!